As soon as the days start getting colder, I feel like having soup. Don’t you? This is one of my favorites, and I have served it to many different crews. Everyone says they love it! My secret ingredient: ginger root. I also use napa cabbage; although sulfites are a no-no in our household, which means no onions and generally avoiding cabbages, this one seems to go down well. If you have sulfite sensitivity, I hope you will be still able to try and enjoy this soup, as my Significant Other has, without any problems! 1. Put water to warm up. You will need it to be boiling by step 5. Prepare chicken, napa cabbage, and ginger juice. 2. 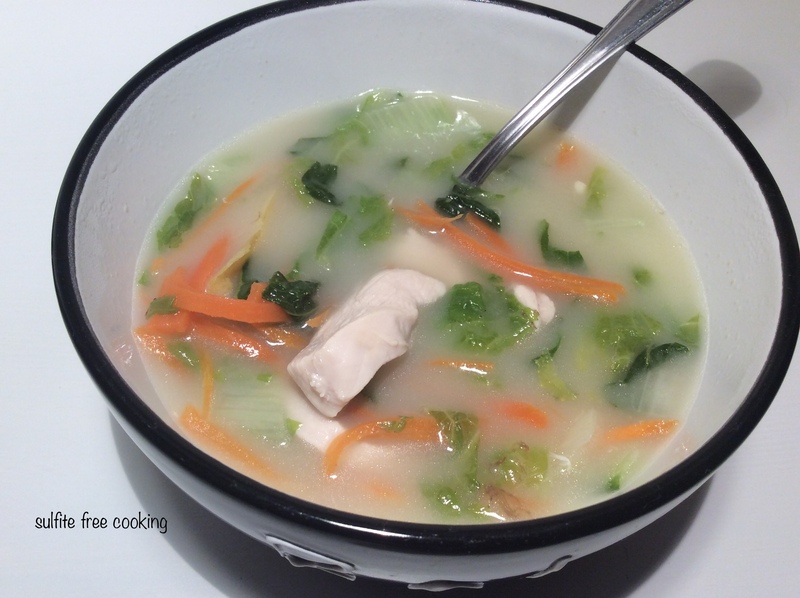 Put coconut milk to boil in a large saucepan. Add chicken strips, lemon rind, cover and cook on lower heat for 5 minutes. 3. Add cabbage to pot, stir with wooden spoon so as to coat well with the coconut milk, cover again and cook 5 more minutes. 4. Meanwhile, cut carrots into julienne strips using a nifty gadget called “julienne cutter”. Feel free to munch on leftover raw bits of carrots. 5. Pour boiling water, ginger juice into the pot. Add salt and carrot strips, stir and let your carrot strips relax in this warm bath as Cleopatra might, except you will want to do it for only about 2 minutes, no more! Serve immediately. The ginger adds a spicy note to this simple, yet sooo good soup. Note that you can also make it with shrimp, provided you know they haven’t had been sprayed with sulfites!